Vijay Sethupathi’s ‘Super Deluxe’ hit the screens on the 29th of March. The movie is receiving an extremely positive response from the audience. The dialogue from the trailer has gained wide popularity, with all celebrities tweeting about it. The latest addition to the list is CSK star, Harbhajan Singh. He is widely popular among twitteratis as he regularly posts tweets with Kollywood references in Tamil. Yesterday (31st March), he has yet again broken the internet with his tweet. CSK who played Rajasthan Royals in a home game on Sunday pulled off a nail-biting finish in the last over. 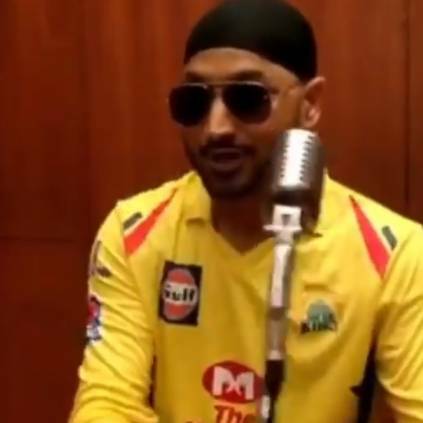 Harbhajan Singh, who did not play the game was very excited though. Post the victory, he posted a tweet in Tamil that was the ‘Super Deluxe’ trailer dialogue with his own twist. He also said, "Thank you Sethu Ji" at the end of the tweet. People looking for online information on Harbhajan Singh, IPL, IPL 2019, Super Deluxe, Vijay Sethupathi will find this news story useful.